Tadaa! And I am back from yet another trip :) But this time, in stead of taking the train somewhere close I flew all the way to Ireland with Liss! A new city and a whole new country for me :) Yay! 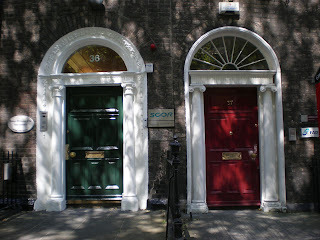 Dublin is a very small city compared to Paris but that was again a very welcome break. And it was very nice and cosy for an industrial city too! Lots of colourful houses and small parks here and there. 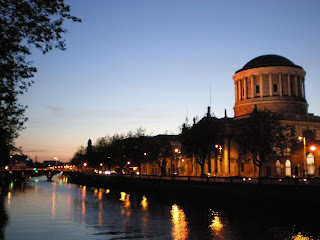 And then of course the river Liffey also added something to the city panorama. As I've said before, it's usually the river that makes the city. 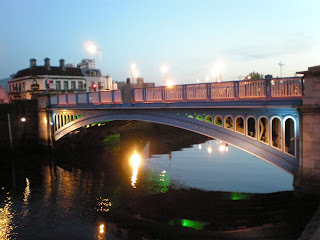 It's very often the area around the water that's the best part of the town, and even though Dublin didn't have any wonderful riverside promenades like for example Paris, the blocks just around it were my favourites. It was here you found that certain athmosphere. Here's what the river looked like in the evening. The big buildning is called the Four Courts and actually reminded me a bit of Pantheon here in Paris. And we were really lucky with the weather while we were there. It didn't rain one single time. In stead it was actuallt really warm and you were able to walk around with a t-shirt very late in the evening. 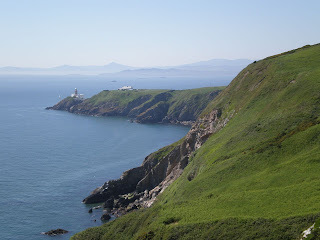 The headland of Howth. Howth is a small village by the sea in the north-eastern suburbs of Dublin. It took about half an hour to get there by the local (green) train called DART. After briefly looking at the village itself, we then climed up on the headland that you can walk around following different small paths. We decided the follow the coastline as much as possible, which meant the longes loop. It took us more than three hours to get around the whole headland and even though the sun was broiling hot and we got very, very tired of climbing up and down the cliffs all the time, it was totally worth it. The views were aboslutely magnificent! Totally splendid! I took a lot of pictures but as always, the photos only give a small hint of what it was like in reality. This was also the first time I saw the sea (or actually any area of water bigger than a river) since I left Finland and I hadn't quite realized how much I've missed it. The lovely smell of the saltwater of the sea, mixed with the smell of seaweed... Hearing the seagulls scream and feeling the refreshing sea breeze on your skin... It was simply lovely. That's all I can say.